Wow what a experience one that will never leave our hearts and minds. All of us came from different backgrounds of swimming which made us the team we were where we decided to name our relay TI6. TI6 consisted of 6 Total Immersion coaches : Dave Cameron from Minnesota, Jai Evans from the UK, Stuart McDougal from California, Todd Erickson from Texas, Rachel VanScoy from Colorado, and Mandy McDougal from California. One common denominator between us all is our extreme passion for teaching swimming with the mindset and methodology of Total Immersion. As much as we thought we were prepared and ready, nothing compares to the amount of drastic emotion, patience, and incredible hope to get us through our week in Dover. We have all swam open water , but luckily in controlled conditions, we have never experienced that mother nature can and will decide when we are ready to tackle the channel as a unit. 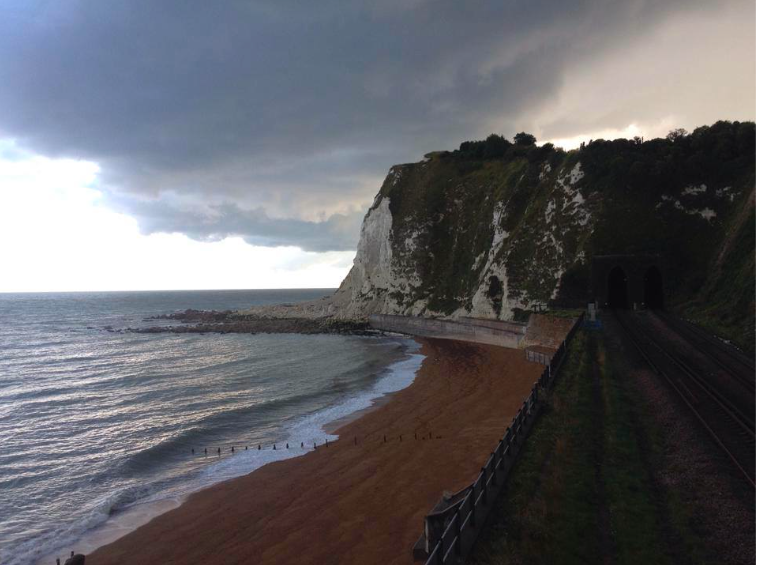 Having arrived in Dover amidst the tail end of Hurricane Bertha, we had the opportunity to train in significantly rough water or what the British classify as a bit “lumpy”. Towards the end of our window of time, we had heard no word from the pilots. To the human eye the weather was not easing off and our relay team was still third on the waiting list to be called. As our window of hope turned for the worst, Dave knew it in his heart that it most likely wasn’t going to happen. So we decided to accept it in our minds that it wasn’t time and that we will have to wait for a better year. 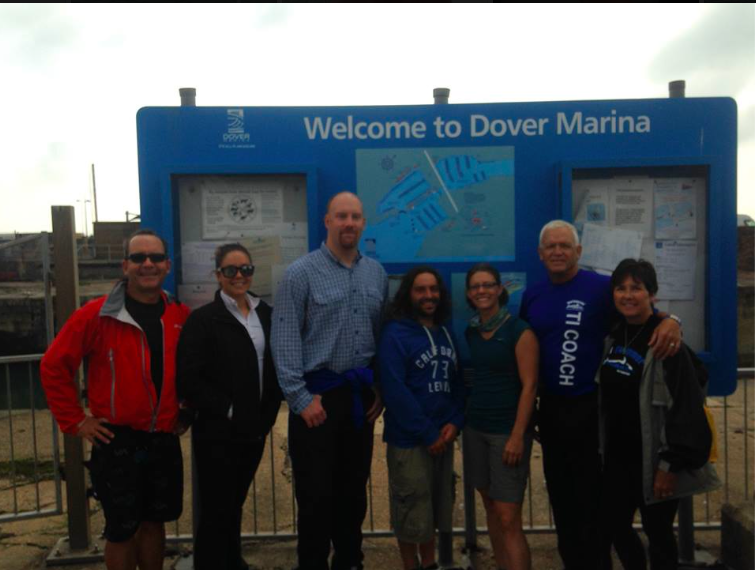 Dave decided to take us on a hike to Shakespeare beach to have one last final open water swim around the official start of the channel. Walking along the coast seeing the beach from afar, we all seemed quiet and a bit melancholy still trying to accept it in our minds that it wasn’t going to happen . Once we made it to the pebbled beach, intense rain, thunder and lightning struck the entire area. It didn’t seem to cross our minds for this particular moment could of been a sign we would later understand but either way we still headed back to town to have one last dinner together as a team. As we arrived at Blakes of Dover with our drinks in hand, we gave a final toast to a amazing week of training. To our surprise, our toast was interrupted by Dave as he answered a phone call that forever changed our trip. The pilot told him that one of the teams decided to wait for better conditions and that we have a shot at making it across the channel at 9:30am sharp the next morning. Once we all heard the news , we had no idea how to take it because most of us were partially excited and somewhat guarded trying to prevent ourselves from further heartache. Besides our feelings, we had a team meeting and got our bags packed ready to go for whatever outcome came our way. As I was packing one of the quotes that stuck in my head at the time was from Mohammad Ali, ” If you stay ready then you never have to “get” ready “. Which seemed to be our motto for our entire trip from arriving, to training, to getting prepped for the possibility of going. It was 7am the next morning and we were more than ready to go. 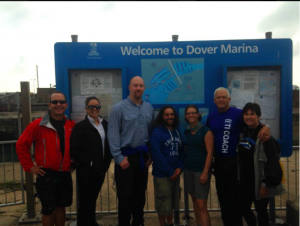 We walked to Dover Marina to meet with our fellow relay teams and to board our boat for the day , the Sea Farer, docked and ready to go to be our faithful companion along the way. As we settled into our boat and met our pilot and crew, it was time to go. The order of our relay was set to start with Todd , then Jai, Rachel, Me, Stuart, and Dave. As Todd was getting ready and revved up to start, the pilot took us to the shores of Shakespeare Beach where our official start was about to take place. All three of the other teams have started ahead of us including the first team starting thirty minutes beforehand which made us the last and final team to take on the course. Todd jumped in without hesitation and started our team off with a solid leg. 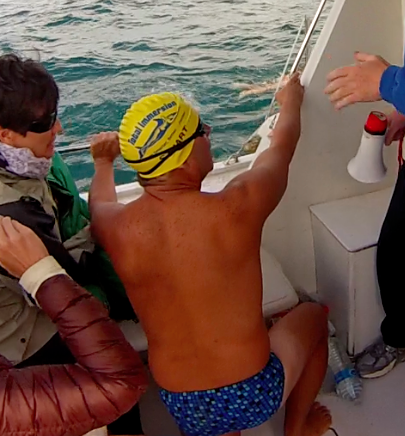 The cold , the chop , and the spring tide pulling us away from course did not stop him from passing the first relay team coming up with graceful efficiency and speed. Todd was hitting 62 strokes consistently throughout his swim with no sign of exhaustion or slowing down. Once the first hour had passed, it was time for Todd to get out and for Jai to take on the next leg for the team. From Todd’s description, the chop and conditions were no different than what we trained in the harbor leading up to the swim which made us all feel more than ready to go. Jai’s stroke resembles something of remarkable fluidity and control. Averaging 60 stokes per minute, he continued to take us further passing another team along the way, with from the looks of his stroke, there was no sign of struggle. Sticking to a relaxed two beat kick and front quadrant stroke it was time for him to let Rachel take the lead. Rachel was ready more than ever for her chance to get our team even farther ahead. As she swam with immense power, at 68 strokes per minute, she finished her leg coming right up to the third relay team paralleled to our boat. With somewhat calm and steady nerves, it was time for me to jump in feet first. Once the horn went off, I was ready to get the team where they needed to be. With a surprisingly relaxed stroke in such turbulent waters, I was able to time the chop to my advantage. Averaging in at 56 strokes per minute I was able to get beyond the third team and on into the middle of the course. Then it was Stuart’s turn to take on the channel as once he jumped in the chopped turned into bigger and larger swells that tested ones efficiency to the core. As Stuart pierced through the water he was able to maintain a solid, strong tempo and hip drive into his stroke which averaged at 58 strokes per minute. The first round was then finished with Dave who drove through the chop with immense power and control at 60 strokes per minute while the rest of us were holding on to the boat as the chop was getting heavy. Dave was able to pull us past the last relay team which made us ahead of the all the other groups. The spring tide threw us off course more than normal but with our ability to stay efficient and strong it didn’t matter what kind of conditions were in our way as we were still making excellent headway throughout the course. It was time for the last round of swims amongst our team that led on into the early afternoon. Todd jumped in for his second leg and felt better during the second swim than the first. Then Jai took on the next and continued with enjoyment and taking it all in before Rachel took over for her next swim. Rachel finished her swim with a few powerful strokes of butterfly then it was my turn to lead the team through the twilight into the darkness. 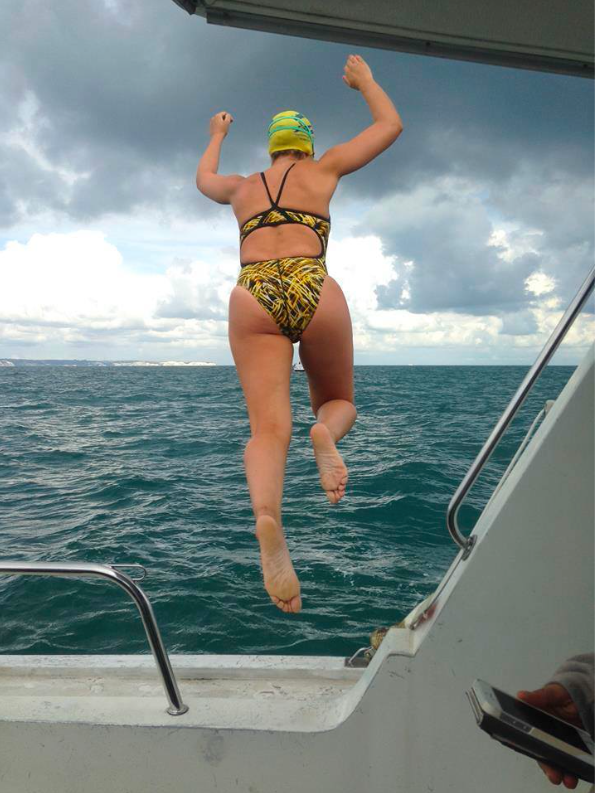 It was Stuarts turn to start the first official night swim of the group where the conditions turned to calmer seas. As the outside temperature drew cooler it was time for Dave to give his best swim of the day and to his account the best swim he had had in months. We were so close to the finish but due to strong currents we needed Todd to suit up and finish another leg to get us onto the shores of Calais. The dark waters were in full effect and Todd was ready to pull it in for the team. Finally we could see the remaining buoys that held us close to the shore where we began to cheer Todd on as he was only a 100 meters away. On the rocky beach of Calais, Todd found steady ground and placed both feet solid on the rocks and waved his hands to officially complete the course. As we all cheered in amazement we couldn’t believe that our team had finished in at 12 hours and 49 minutes before the rest of the teams made way. It was a amazing experience and a unforgettable one. We were a team that came together, supported one another, and trained harder than ever to give as much as we could to pull in a outstanding result.